Who said, “Speak softly and carry a big mallet.”? I forgot to give details of this some time back when I promised to give details of the best wooden mallet I ever came across. An elderly woodsman from Cheshire showed me a beautiful mallet that’s now buried somewhere in my monstrous collection of user woodworking tools on two continents. I say buried because I put special and unique aspects of my tools in wraps for when I complete the book I’ve prepared regarding the importance of tools to the generations of woodworking craftsmen. That’s beside the point. About 40 years ago I saw tools in a chest beneath a bench of a man I knew for a few years. He was a country man who built fencing and new the nature of anything you needed to know about hedging of any kind. Nestled amidst Ultimatum braces and brass and ebony shoulder planes, chariot planes and Norris infils was a wooden mallet made from beech but rich in those hues no modern stain maker seems at all able to match. I pulled the mallet from the nest and placed it on the bench at his request. It stood like mine does above and looked so lovely that we both stood and stared at it for a minute or two before anyone spoke. The light glanced the facets that held our gaze so and filtering as it did through the window-light as it did I couldn’t help but ask if it might be for sale. “Aye!” He said, but you’ll ‘ave ter buy the lot.” I looked under the bench at a full set of pig-stickers, jointers, jacks and tri-planes and said, “OK.” The deal was done and I owned a mallet I liked. One thing that struck me (no Pun here) about the mallet was the care the owner had taken in its design, but way beyond even that, I liked the care he had taken of the mallet that was a good 100 years old. These drawings detail my mallet. It has the best balance of any mallet I’ve made or owned and it’s heavier than the old one by 25%, which I like. This one is made from an unusual wood – cedar elm. Instead of me telling you about the tree itself, please go to this site and I’ll tell you little of what’s inside it. Few non-tropical woods are as dense and close-grained as cedar elm. I doubt you could drive any size of nail home in it without it buckling at the first or second blow. I have two mallets I have made to the design of the old find. 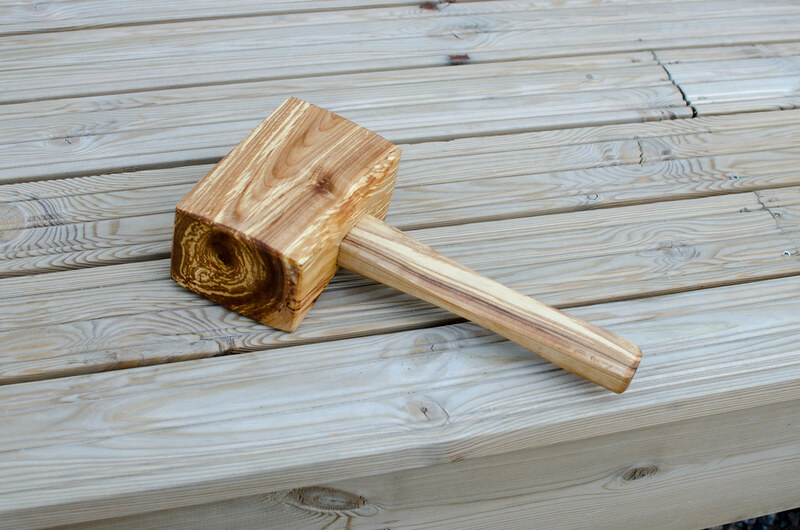 My other equally favoured mallet is made from Osage Orange, also known as Bois d`arc, a unique wood with half a dozen other names too. Anyway, my mallet has dished only 1/16” in 20 years. There are no cracks or fissures anywhere and it’s heavy and hard. 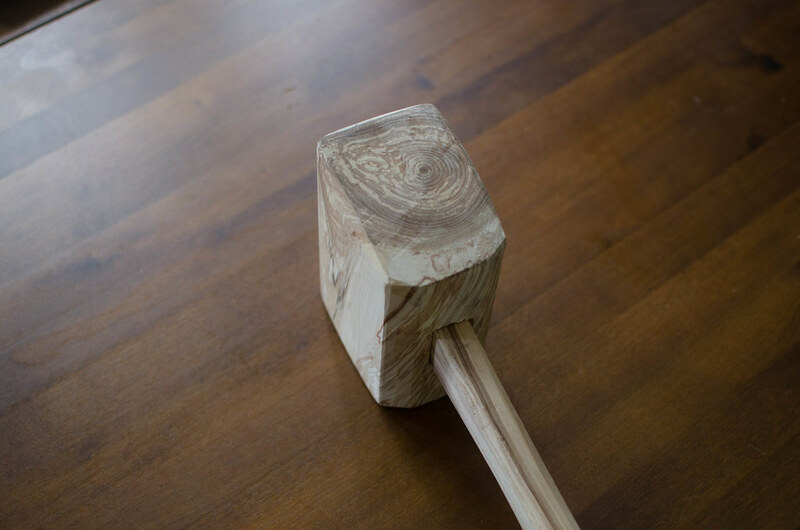 I heard someone somewhat influential say you didn’t need a heavy, hard mallet for joinery and I listened, considered his words, and decided a heavy mallet can tap as lightly as a lightweight one or deliver more than a lightweight one in one tool. Hence the saying, “Tap softly with a heavy mallet.” Heavy mallets are practical, adaptable and they are nice to have when you need them. 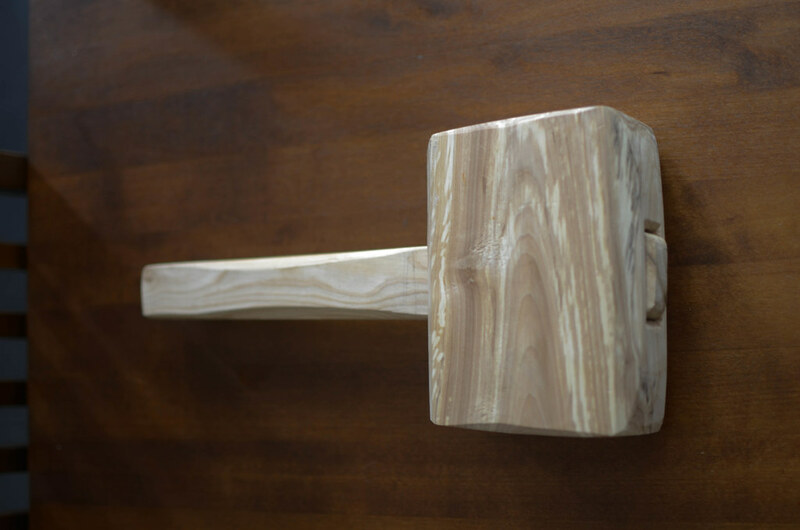 I also like my Osage mallet because, like the Cedar elm, it is defiantly durable under any and all pressure, it dishes only marginally, and it does not surface fracture on end grain, as will many woods typically used for mallets such as beech and oak. Hard maple works well for mallets too. Not as well as Osage Orange and Cedar Elm, but it will work. On my mallet, that follows the old original one, the sides are not flat like the ones you buy, but shaped as shown in the drawing above and in the photo left. The end too is round as you can also see (that’s the top edge in pic). This improves the dynamic of the mallet substantially. A scallop to the inside corners also improves the shape to remove the clunkiness so that it moves through the air like a jet to strike dead on that sweet spot scientists call COP (centre of percussion). I like the angular handle shaped again by simple scallops to give a hexagonal shape. This improved grip over oval handles and directs the blow more accurately. My wood came from Texas. Cut and air-dried for over seven years, it has never moved or distorted one iota. So too my Osage Orange, which came from an old fencepost in the ground for 50 years and as gnarly as a Texas Dry Frio riverbed. I know, I know! Where are you going to get Cedar Elm 3” thick from. OK, I’m sorry for building you up and then letting the wind out. The three inch thick head is about 45 years of Texas HillCountry growth. Not the most conducive to fast growth, but one of the few regions this tree grows in the US. Oh, by the way, protruding handles sticking out too much are a problem in tight spaces. Allow them to protrude until you thing they have shrunk as much as they can and they have also tightened into the mortise hole. That way they will not go too deep inside the hole later. See picture above. There Aren’t Enough of Us-Yet! Thank you. I recently purchased a 3in thick slab of hard ambrosia maple (Thank you West Penn Hardwoods) just for this purpose. I wasn’t happy with commercial mallets I had seen, and some other internet measurements that I have seen look ..just….wrong. Yours doesn’t, and your endorsement is more than enough for me. You’ve been an inspiration, and I hope to be well enough to soon take one of your courses (rheumatoid arthritis.) here in NY. I have to admit that the idea of traveling to Wales to take it in a castle is extremely appealing too. I’ve got some maple to use for a mallet so I’m pleased to see your drawings, Paul. Could you let us know the weight of your mallet? I’d also be interested in hearing some more about the center of percussion and how it influences the mallet’s balance. Fantastic. I just got a cedar elm trunk from a tree that died in a friends yard. 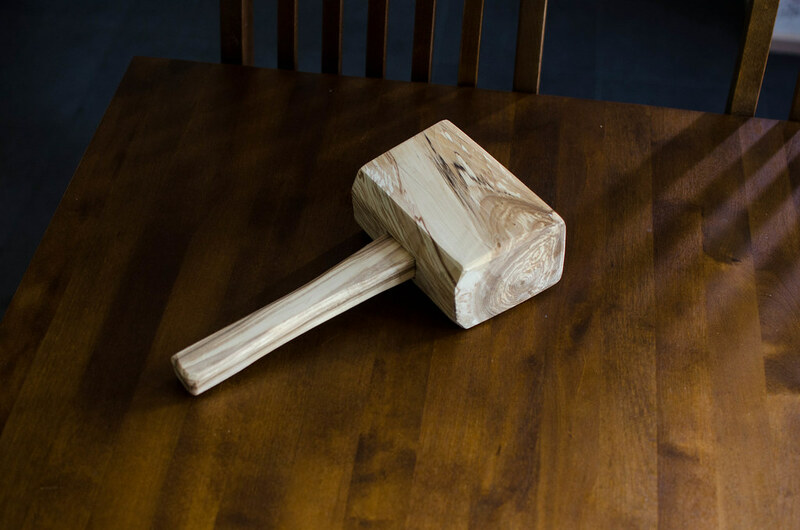 I’ll make a mallet with left overs. Greetings from Houston TX! A buddy of mine had a huge cedar elm branch fall in his yard after a thunderstorm. A nice chunk of crotch wood will be my mallet! I’ve been using a mallet of your design (made by somebody who studied under you in Texas, I believe) for several years now, and I do like it a lot. But I’m puzzled about one little feature of the mallet. Why are the bottom edges of the head shaped like that? Is there a purpose for the stopped chamfer? (That’s probably the wrong term for it, but I can’t think what else to call it.) Or is that just an aesthetic touch? Without the chamfers to the handle it’s very angular and uncomfortable obviously. In the inside corner of the mallet head it is more aesthetic but all chamfers make things more comfortable to pick up and pass from hand to hand. The only chunk of wood I have thick enough on hand for the head is red oak. Will that work ok or should I hold off until I get to a lumber yard? You know what, Walter? I’d go with what you’ve got. I’ve made red oak mallets and the worked just fine. Hmm. I have an Osage orange growing in the backyard here in Ohio. Tempting! The only thing anyone ever mentions using them for around here is that the Indians used to make their bows out of them. But probably I’ll let it stand. Great series as always, thank you Paul. Just find a small saw miller somewhere and ask them if they have any 3″ osage hanging around. They usually do. In Texas they used osage for fence posts and that’s how I came up with my mallet heads. There is a sawmill not far from here. I’ll try that. Thanks again sir! Thanks Paul, I rescued a mesquite log that was bound for firewood in my Arizona back yard. It quickly became a mallet thanks to your videos and your blog. I have not rounded the corners yet so I’m afraid it will not fly through the air like a jet. If you build to this drawing you will never get the handle past half way when you try to assemble it. The mortise needs to be closer to 1″ 5/8 (1″ 39/64 more accurately) at the bottom to work out mathematically to the handle drawing. 1″ 1/2 would put your mortise the size of the center of the handle. Any opinions on rowan wood for a mallet head? 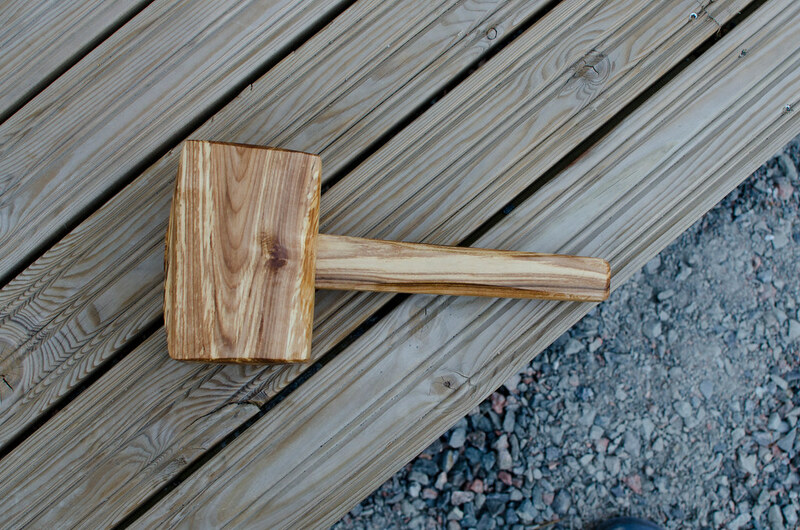 I watched your mallet videos and I made the mallet from this piece of rowan wood, I did some errors and mis-remembered which other to take things and tried shaping the head different, but I got a usable mallet out of it. 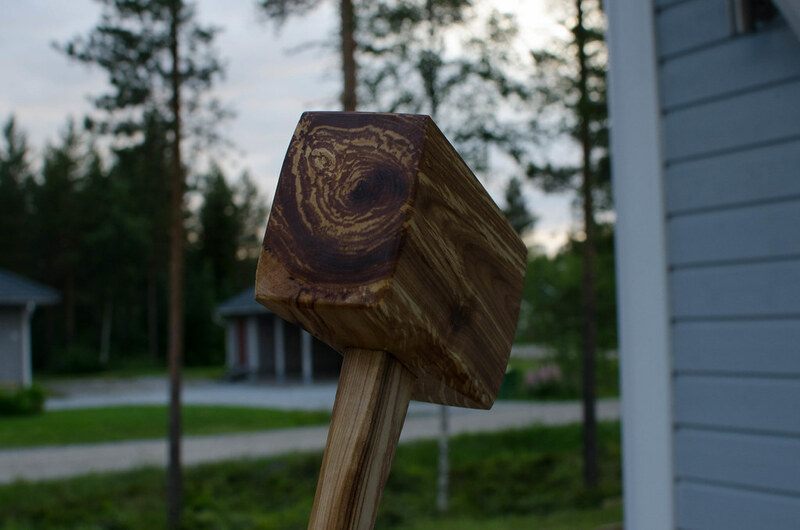 I think I’ll trim the bottom of the mallet head yet and make it a little bit shorter, the shaft was also a bit short but I used the longest piece of firewood I found in the pile at the cottage I got it from. Nothing wrong with that. Greta project and well done. I hope to have lots of use for this, the size and heft and momentum it brings compared to a smaller soft faced hammer is noticeable. I am just getting into wood working and stumbled upon this site. Amazing. Thank you for being so generous with your posts and videos. Question on this – I have a piece of outdoor cedar left over from a post. Any reason why this couldn’t work as a mallet head? Paul, I am a new aspiring woodworker. Putting together a similar mallet will be my first attempt at a true mortise. (That’s how new I am!) I recently purchased some Marblewood in Houston, TX. The wood was covered in wax when I purchased it. Needless to say it is still wet. If I build a mallet out of it wet will that greatly affect the mallet in coming years? It will affect it in a few weeks. It should not have been sold wet but dried with ends sealed in longer lengths and the, after drying, cut to shorter blocks and end sealed with wax. Bad boys and girls whoever did that. Well 4″ works well and you can always reduce it after it’s together if weight is an issue. Beautiful. I’d really like to make this. Hi Paul! Big fan! I took your advise on Osage Orange for a mallet and found a gentleman in North Texas with a fallen Bodark tree that he had to get rid of. Needless to say, I drove the 1 hour to pick up several rounds from him, all ranging in diameter of 7″ up to 15″. It rained a lot so the grain really popped when I dug through the cutoff pile for a few trunk logs. What is your advise of pairing this down to use for wood? It is sitting in my garage, not really air blowing, but should I take this to someone that can cut the 2-3″ long logs into planks? Or should I keep as is, and let it dry out for 6 months before cutting up into the 6x4x3 size for the mallet head? 2-3 feet long, not inches. I can send a photo if you like. I left the twisted limbs 3-5″ thinking I couldn’t do anything with these. I made one from an old birch branch that has been sitting around taking up space. So far so good. The single biggest worry I have is my finger getting between the head and the end of a chisel. I have a couple of flattened finger tips which have never been fun to produce.